I had been looking forward to this race the whole year. At the same time I had trepidation. I hadn’t really trained hard this year. A lot of things were happening in my personal and professional life that took precedence and frankly I just didn’t feel like waking up at 3 AM for those long runs like I had the previous year. That being said, the minimal training seemed to agree with me. 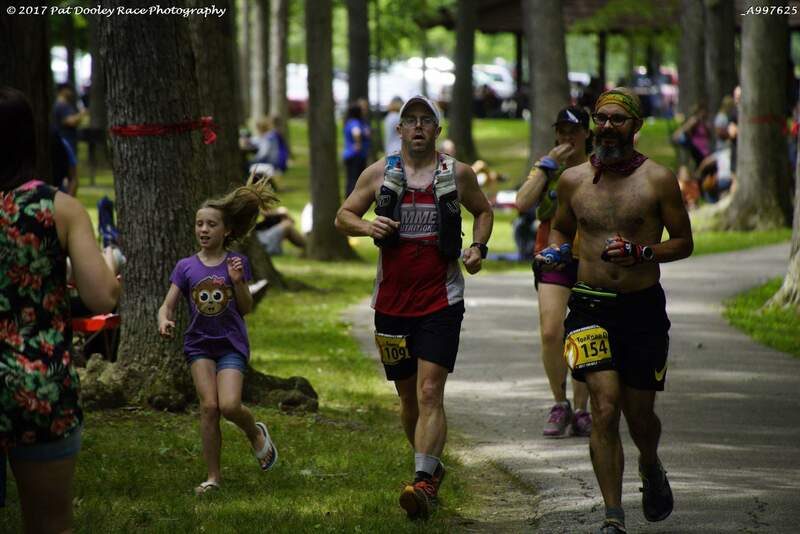 The Glacier Ridge trail 50 miler went better than expected and recovery was fast. Same with the Hell Hath No Hurry 50 miler. Those two runs surely put some hay in the barn. The week leading up to the race I was nervous. More nervous than the previous year even. Kim said it was probably because I knew what I was getting into this time around and I agreed. Despite a DNF dropping of my own accord at Mile 82 I had another incredible experience and am already registered for 2018 to get the job done. Friday night was packet pickup and a pre-race dinner. I opted to get in and out quickly and to spend the balance of my time resting if not sleeping. My stomach was in knots, but eating did seem to help somewhat. I met up with Terry, Alicia, and their kids for the pre-race dinner. Carbs with a side of carbs was on the menu. It was a buffet and there was salad (swoon), pasta, ravioli, two sauces, and an assortment of breads. It was all delicious and I ate seconds. Upon settling in to my room I received a low balance alert on my checking account. Startled I checked the account to find that the hotel had charged the room to my debit card I reserved the room with instead of the card I presented upon check-in. The matter was quickly resolved. On my way from the front desk I saw Scott and Lynn. We chatted for a few moments and then it was off to bed. I lay there awake getting up a few times just to double and triple check I had everything I needed in order. After 3 1/2 hours of something loosely resembling sleep it was wake-up time…1:30 AM. I grabbed coffee and ate a pastry and headed to the shuttle pickup area. Sitting closer to the back was a bad idea. Every bump in the road tore through my stomach. It felt as if a fist was squeezing tight around it. After a seemingly endless ride we arrived at Squire’s Castle. Yes, it is an actual castle in Willoughby Hills just east of Cleveland. The Castle was built in the 1890’s by Feargus B. Squire as a gatekeeper’s house. However, the planned estate was never built. It was eventually sold and had been a Cleveland Metropark since 1925. Eventually groups of strange and likely dangerous people decided running 50 or 100 miles in one shot was a great idea. Some of these people formed an organization called Western Reserve Racing which put on races of this type. This particular race would start from this particular castle. picture and then wrote Kim. Kim’s husband Tom would be running the race for his third year in a row and she was there to crew. These two run a tight ship, pun intended. Kim offered to crew for me until mile 50 when Monica, Mike, and Jaye would arrive. I found Tom and Kim in their car and had a seat giving Kim my bag, which contained an extra pair of Luna sandals, my wallet, a charge cable, and not much else. About ten minutes before the start we walked up and lined up. The National Anthem was sung and the race started soon thereafter. We were off on the first 11 mile stretch of the course which was roads all the way to the Aid Station at Polo Fields. I held myself back and focused on short stride and easy effort staying between 10:30-11:30 min miles knowing that a little conservation early on could be the difference between success and failure. Tom and I ran together and chatted for a few miles and parted ways at a bathroom break. The morning air was cool and the humidity was low. I couldn’t ask for a better morning to start this adventure. Coming into Polo Fields I had some bacon, watermelon, and a few other snacks. I saw Kim and Tom by the car and stopped by to drop off my headlamp before continuing. The next 10 miles was dominated by bridle trails. The Harper Ridge Aid Station is at mile 18. As I was coming in I passed a girl who looked really familiar. She said my name and it hit me. “Hi Aimee!” We chatted for a moment as we walked in. Volunteers took my bottles and refilled them while I ate some chips and pb&j squares. Kelly came into the aid station. I was shocked to see him. The 50 mile runners started a full hour after the 100 and he had caught me already. He was long gone before I left the aid station. Later I would find out he finished the 50 in a little over 9 hours! It was just a little over 3 miles to the next aid station where Kim would be, Shadow Lake. Scott was there and he filled a bottle for me as I hit my drop bag up for a fresh buff and a Hammer Raw Energy bar to take on the road. I gave Kim the shirt off my back literally. The nasty, soaking wet shirt. People who volunteer at ultras and friends that crew and pace are quite the selfless breed. We are some filthy nasty runners even at 1/5 of the way into the race! After some eats I left the Shadow Lake heading towards Egbert, which is always one of my favorite stops. My knee was getting very sore on the downhills since a little after Polo Fields. It was a pain I was familiar with. Stemming from ITBS this pain was very concerning this early in the race and it was about to get worse. The first stretch of singletrack trail was here around mile 22. A crossing guard helped us all across a busy road. That volunteer was none other than Will! It was good to see a friendly familiar face. Entering the singletrack I let a few people in front of me and took my time. The trail was killing my knee and I walked most of the next 2 miles until coming out again on some sidewalk. I readjusted my Lunas and felt a little better in doing so. Lynn came flying past and stopped to give me a hug. Coming into Egbert I was chatting with a few 50 mile runners who were getting burnt out from running the first 1/2 hard. We were all happy to see the sign that said “Aid Station 0.25 miles ahead.” This year crew was not allowed at Egbert, but it was a drop bag location for the 50 milers. Lynn was there changing socks and we talked for a moment. I had what could best be described as Nutella quesadilla with banana slices followed by some pickles, chips, and whatever else looked good. Hmmmm..now that I say it out loud I couldn’t fault a person for asking me if I was pregnant. No sir, I’m not pregnant. I run ultras. We are hungrier than pregnant mamas. Taking some twizzlers and a handful of chips I walked back out on the trail. The Alexander Road aid station roughly marking 50k was next. This station is always put on by Black Girls Run. 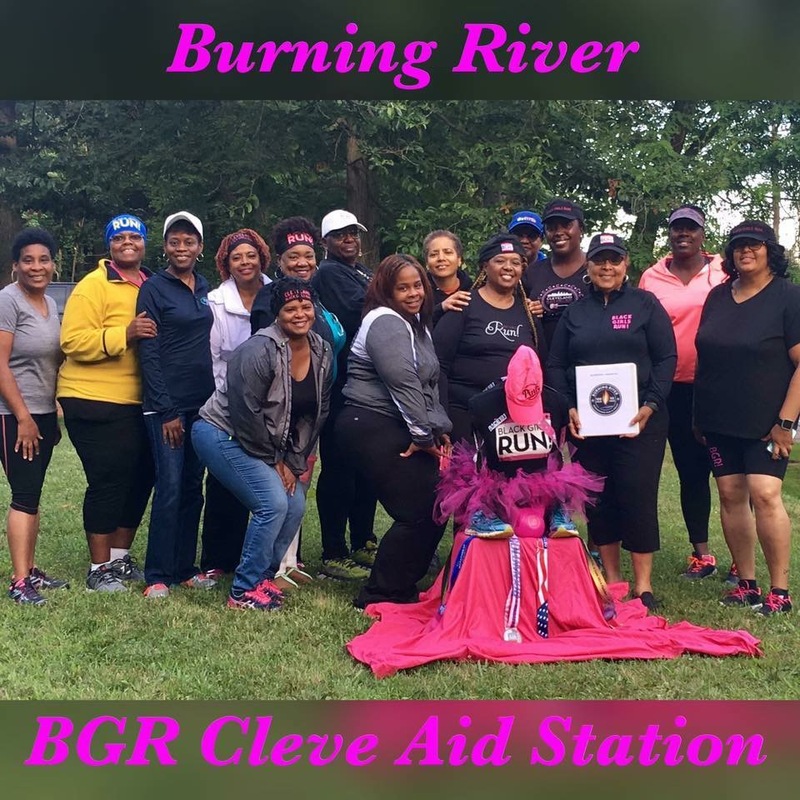 BGR is an organization committed to helping African American girls lead healthier lifestyles and these ladies put on one incredible Aid Station! High energy, great eats, and a whole lot of positive energy can be found here. I left in good spirits steeling myself mentally for what lay ahead. In just 2 miles was a water stop followed by 3 miles in the open sun on the towpath. Even on a relatively cool day I was burning up and walked most of this stretch. At the end one is treated to the Brecksville platform, a train stop with water fountains and indoor bathrooms. From here it is a short, easy, and mostly shaded run to Meadows at Mile 38. In the last mile to the Aid Station I caught up to Terry. I had fallen behind him considerably due to knee pain on the single track. The pain had passed and all felt good again. I wouldn’t have more than slight discomfort for the rest of the race. Terry and I talked and soon were coming into Meadows. I turned right and heard Terry telling me it was the other way. They used a different shelter this year. I heard my name and looked over to see Margaret and her two kids! Margaret and I worked together for a few years at Outdoor Odyssey at Roaring Run. We hadn’t seen each other in over 10 years. She asked if I wanted to sit. She had made her own Aid Station up with sandwiches, soda, pickles, candy. It was awesome. My stomach, on the other hand had been getting worse throughout the day. I had a pickle and some coke and we chatted for a few minutes. Kim and Scott came up to see if I needed anything. Leaving my friend far too soon I stopped to see if there was any other food I could get down and was off. As I left Terry’s daughter told me to hurry up that “daddy already left.” I laughed as I continued on. There was less than a half marathon to go until I’d see friends and pick up my first pacer, Mike! Running distance is a roller coaster. One second you are on top of the world and the next you are suffering with each step. The 3 miles to Ottawa Point doesn’t stand out in my mind aside from arriving there and being happy it was a full aid station. As I crossed the timing mat a girl approached me. Matt’s friend Cari was running the relay and he had mentioned to her I’d be out there and showed her a picture. I stretched a bit and ate what little I could. Now the trail was getting more difficult. 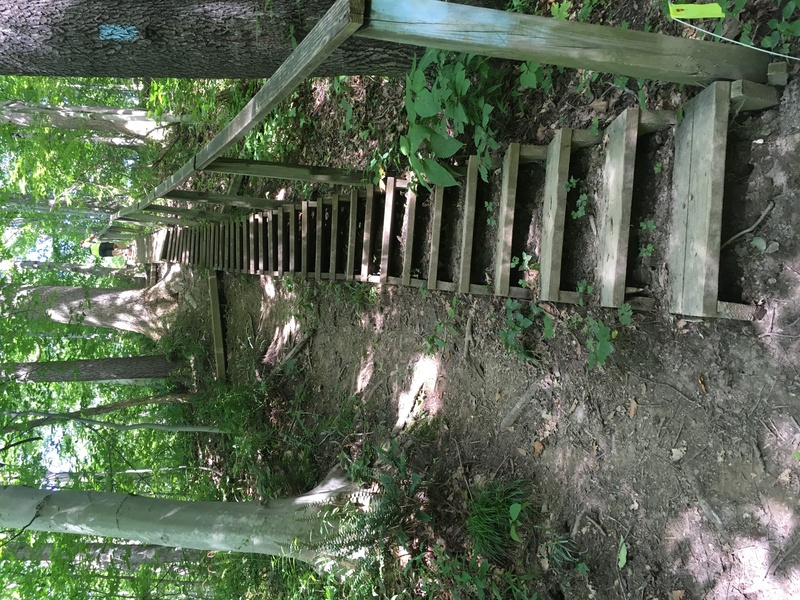 We were on the Buckeye Trail and it had a number of climbs. Still, my legs felt ok. The Bog of Despair was not particularly boggy on this dry day. I was grateful. Snowville Aid Station was next at mile 45. 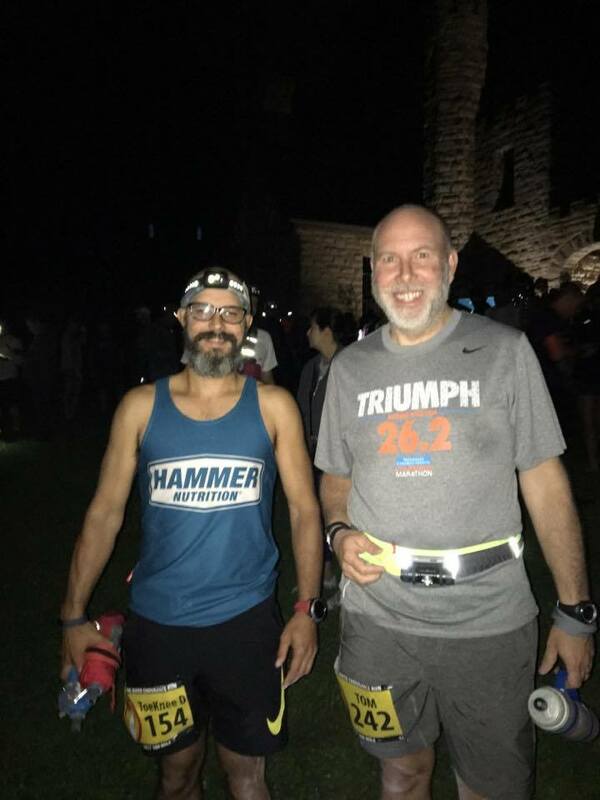 The 50 miler runners were tired, but excited. I ate some watermelon and had some cold soda. The next 5 miles had some challenging moments. My stomach issues were getting worse. Leaving Snowville you cross a road and take a trail into the forest. A trail that leads to a giant stair set. I mean giant in two ways; it was a long set, but also the steps were very high. The trail at the top was very runnable , but I wasn’t running much. At the top I met Christy. She is from Seattle and her and a friend were here to cross Ohio off the list of states that they ran 50 or more miles in. We talked about races here and in the Pacific Northwest and time went by quickly. I couldn’t keep up with her too long as my stomach had other plans. After 1-2 miles I ducked off in the woods for one of many stops to help fertilize the forest. Thankfully I always keep a ziplock of tp with me on trail. There is one other major set of stairs in this last stretch to Boston Mills. The piano keys is a set of 87 stairs. They are short so I found them to be easier than they looked. Still it was a challenge. It was a slow grind in to Mile 50, but I was running again by the end and felt strong coming across the line at Boston Mills. Mud single barrel hydraquiver which I wore without a shirt. This is the first pack I’ve owned I could wear shirtless! My Garmin was attached to the shoulder strap and connected to a charger. Time for food. Looking at the Aid Station fare nothing was appetizing. I needed some real food. Lo and behold there was a hot dog vendor! Kim bought me a dog and Mike and I headed off towards Ledges where I knew pizza and ramen noodles awaited. As we talked and walked we came to the turn from the bicycle path. I had lost track of time as we talked and wasted a flat mile or more that could have been run. No big deal though. It would be a long day still. We soon came to Brandywine Falls, A beautiful spot and I stopped to snap a quick pic of the falls. Then it was off to the aid station. I restocked my ziplock of tp at the rest room, had some ramen (nice surprise there! I thought there wouldn’t be any until Ledges) and we headed off on the next 6 mile stretch to Pine Lane. There was a trail detour here that led up a big climb on loose gravel paralleling the turnpike. It was still warm out and this stretch was in open sun. Once past this point we met up with some other runners. A young man was there pacing. Eleven years old young and he was preparing for his first 100 mile race! He had run around 50 miles before and the kid was hooked. At Pine Lane now it was getting harder for me to eat. I suspected I was getting dehydrated and began drinking more water and took endurolytes. It was just under 2.5 miles to a water station, much of it easy rolling road. We passed a farm and I noted the sky was getting darker. Last year I was still under bright skies at this point. This year, however, my legs were in much better shape and I was certain I would make some lost time up over the back half of the course. This proved to be false. From the Hike & Bike trailhead where a water buffalo was stationed we took to a paved trail. Nice and easy running for a mile or so and only 4.4 miles to Ledges AS. Soon after we took to that paved trail I heard someone call out. Looking back it was Sarah and a friend rolling through looking strong. I tried to keep up, but the gradual slope eventually won out forcing me to walk. There are a few good climbs in this section. We took our time and kept moving always. Coming in to the Ledges Aid Station I was around 1 1/2 hours ahead of the cutoff. This made me a little nervous. I’d have preferred an hour or more extra wiggle room, but it was still a fair bit of extra time. I sat down and had a bowl of ramen, soda, and potatoes and talked with everyone. Leaving Ledges there is a great mile or so of easy trail that I delighted in running. From here it got more difficult. Now whether it was actually difficult or if it was the 68 miles on my legs making it seem difficult is hard to say. Mike did a great job keeping me occupied and laughing as we talked and clicked off the miles. From Ledges, it was a little under 6 miles to Pine Hollow. I was looking forward to this Aid Station for a few reasons. First, it is a beautiful little spot atop a hill in fields. Second, this is one of the aid stations visited twice. The first time there is roughly 50k from the finish and the second time there is about a marathon away. This was the point in last year’s race I really comprehended finishing. The first loop went very slow. My stomach had not gotten better over the day. I lost more time against the cutoff on this loop and coming in to Pine Hollow 2 I resolved to get in and out as quick as possible. I had some soup broth and not much else. Here Jaye took over pacing. I was not particular talkative at this point and soon after starting had to duck into the trees to make like a bear. Jaye kept me moving along as quick as I was able at that point. I was deep in the pain cave and she was awesome. Will and Christy came by. Turns out Will saw her and asked if she wanted a pacer. Once again I tried to keep up, but there was no chance of me doing so at that point. Things went from bad, but bearable, to terrible fairly quick from there. The 6 miles seemed to take 10 hours. Eventually, I found myself almost vomiting and entirely zapped of energy. I was stumbling through a cornfield and came down a stretch of road when Tom and Sarah passed me. Later Sarah would tell me that I looked like sh*t. I had doubts, but kept telling myself I would keep going until the job was done or I was pulled for missing a cutoff, but by the time I got to Covered Bridge, still a full 15 minutes ahead of the cutoff, my resolve broke. With just 20 miles left I dropped and promptly fell asleep in a chair. 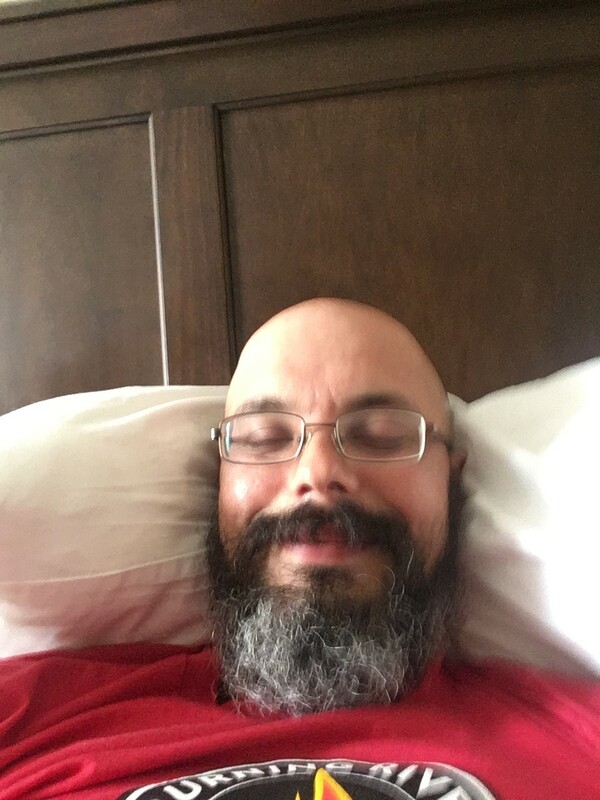 Jaye covered me with mylar blankets and called Monica & Mike who drove out to pick us up. 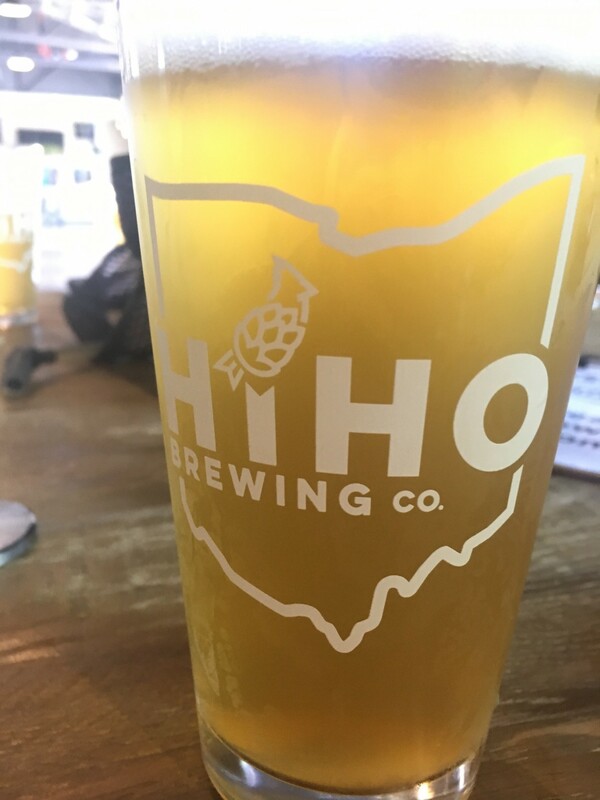 After a shower and a couple hours of sleep Mike, Will, and I headed down to HiHo Brewery to congratulate the finishers and grab some grub and brews. Sure I would have preferred to finish. That goes without saying. Still I am happy with the run. My legs were in much better shape than the previous year and I was able to walk fairly well just a day later. I have been worse off after some marathons in that respect. I spent a lot of time sleeping over the next few days and was ready for a short run by Thursday. I can not say with certainty what went wrong though I have a few ideas. Weather – It was perfect for July. We couldn’t have been luckier. Running a conservative front 50 – Slow & steady doesn’t win the race, but it does finish the ultra (usually). Choice of friends – damn they were all awesome all weekend! I am a lucky guy. My stomach was the enemy for the entire race. Still, looking back I wonder if I had taken more electrolytes or if I had forced food down at Pine Hollow 2 if the outcome would have been different. 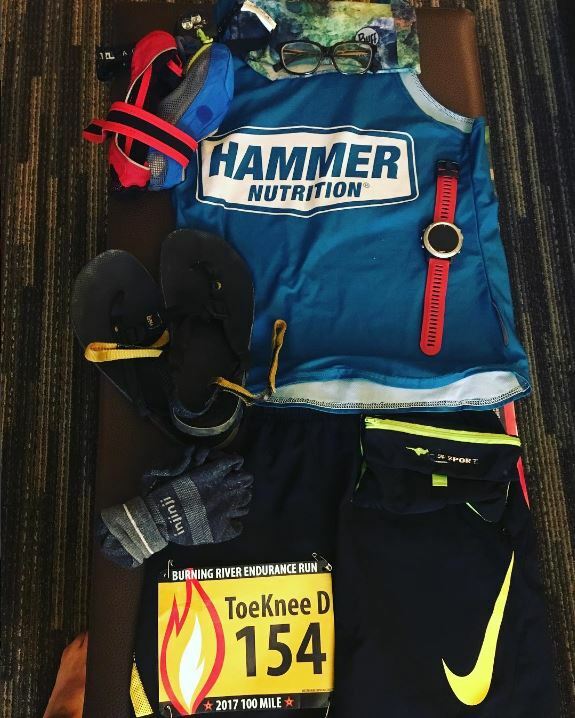 I was incredibly nervous for days leading up to the race, maybe even more than my first marathon. This may have triggered the stomach issues. Even after the first 11 miles to Polo Fields there was a ball of tension in my gut. 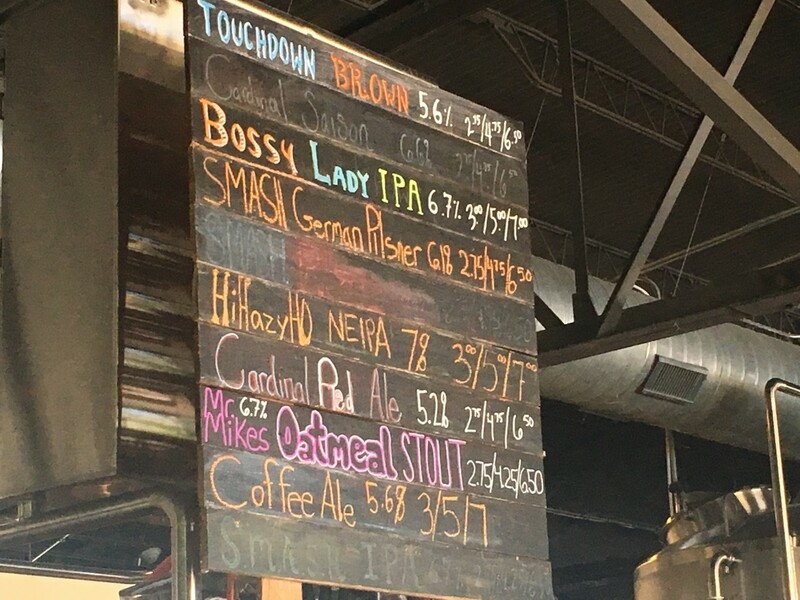 Possible dehydration – It is likely I ended up dehydrated around mile 50. I have to take more careful stock of my hydration. 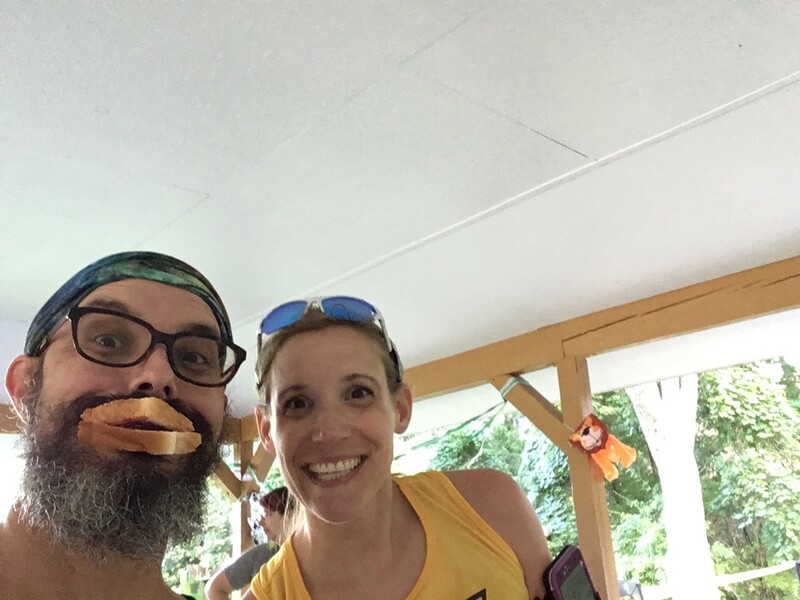 Too much sugar – The Aid Station captain at Covered Bridge (Mile 82) was certain I was dehydrated and had too much sugar causing excessive urination. He felt that if I got water and electrolytes in I could continue. Maybe he was right, but I was in no mood to find out and dismissed his idea immediately. Looking back with a clearer mind and there likely was merit to his assessment. I drank waaaaay more soda than I ever do during a race. I was hitting the ginger ale heavy. It felt good on my stomach. Then at mile 50 I had a fair amount of Mountain Dew. I hate that stuff, but it went down good with the hot dog. Usually, I don’t start hitting soda until much later in a race and I will be more careful in the future. Hammer Raw Energy bars, Heed, Endurolytes and Endurolytes Extreme, Race Caps, and Amino Endurance caps. I had a double serving of Recoverite over the course of Sunday. As mentioned, I am already registered for next year’s Burning River 100. I am registered for the Steamtown Marathon. Now the question is what to do until then….